Moose Madness Bonus is divided into four sections. 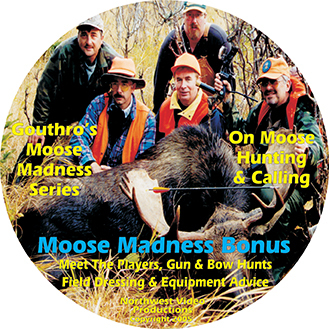 This DVD is meant to be fun, and the first chapter is a tribute to the many persons who contributed to the Gouthro's Moose Madness Series. Then you see two moose being harvested on successful hunts (one bow hunt and one gun hunt), followed by demonstrations of a unique way of field dressing moose when weight is a factor - as when on fly-in hunts or when the meat has to be carried a long way. In the final chapter Alex discusses suitable weapons for hunting moose and then shares some thoughts about equipment he has found useful over the years when hunting moose -- a fitting end to the Gouthro's Moose Madness Series On Moose Hunting & Calling.